For our October design issue, we asked local design professionals to share their opinions on wall-panel headboards. Here is what they had to say. “Wall-paneled headboards are a classic trend. They are very popular in todays streamlined home, but we have seen them in different forms in the past. They keep coming back around and I’m sure this isn’t the last we will see of this classic design element.” Carolyn Brotherton, Design & Detail. “Classic!!! Wall-mounted headboards can make a big design statement as well as save space in a bedroom.....choosing the right fabric can transform your drab bedroom wall into a work of art!” Mary Beth Leritz, LuLu Belles Fabrics. “I think if everyone were doing this it would be a craze, but this style is still very unique and can be a classic depending on the size, style and fabric. A wall-panel headboard makes quite a bold statement in a room, whether it’s the full wall or just floor to ceiling behind the bed. They can make a small room seem grand, and it’s a useful tool in a designer’s toolbox. 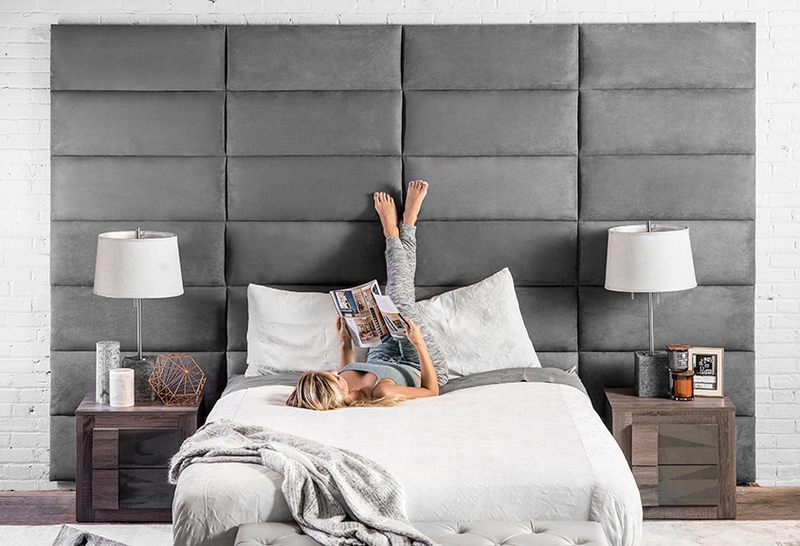 I think the wall-panel headboard should go big or go home: if you’re going to do it, do it big for the drama it can create!” Dana King, Next Project Studio. “I think they are absolutely a craze! Transitional design doesn't have much staying power. Trendy now, but soon it will look dated and oh so 2017. Then, on to the next trend.” Teddy Karl, The Great Cover-Up. “They are a craze, but with a classic twist. Most classic designs started as a craze, but good design has made them stand up to the test of time and made them a classic. Fads come and go and those with good design seem to come back in popularity about every 30-40 years. So what will be the next revival of a previous fad?” Barbara Allen, Inside Out. “Just as sleigh beds were so 2013, next came upholstered headboards and then four-post or canopy beds. Design is like fashion, it begins on the runway, or for interiors it's called ‘market.’ High-end designs make their debut, they become so popular and the ‘must-have-look of the season.’ Soon enough they are available everywhere and the market becomes over-saturated and eventually passé'. Wall-panel headboards may be here today and gone tomorrow. My vote is craze.” Joni Spear, Joni Spear Interior Design. One lucky winner will receive a gift card for a Vänt wall panel headboard to fit a twin, queen, or king-sized bed. The most innovative and user-friendly wall décor system ever created, Vänt panels completely transform a room in just minutes. They're perfect for every room in the house, from the kitchen and living room to the office and bedroom, and are available in different configurations to suit any need with endless possibilities. Go with one simple style or mix and match for a gorgeous, customized look. Inspired spaces make for inspired living, and that's why you'll love Vänt. Choose from dozens of eye-catching colors in easy-care finishes such as new Vintage Leather, Cotton Weave, Pearl, Leatherette, Micro Suede, and Metallic. There's no experience necessary to hang the panels, as their patent-pending SimpleMount™ System makes it virtually impossible to get it wrong. The panels are easily removable for cleaning. See the entire selection at www.vantpanels.com. Enter at here for your chance to win. Entries accepted through Oct. 20, 2017. The winner will be announced on social media Oct. 24.